Isn’t watching the sun go down together one of the most romantic and beautiful things you could do with your partner? I’m pretty sure; most people have that famous sunset in mind when booking a trip to Santorini. On my most recent trip, I scoured the whole island to find you the best spots to take this moment in with your loved one. And I tell you, it was as breathtaking as they say. The first night I nearly missed the magical moment as I arrived pretty late that afternoon, but thank god for long summer nights. I made my way up to Imerovigli, just a 5 minutes drive from where I was staying. I later heard, it is a bit of an insider’s tip when it comes to sunsets on the island to make an early booking and go down the hill to one of the cocktail bars. I ended up only glimpse a few of these beautiful views while walking down the stairs to my chosen Restaurant Mezzo. Arriving late with no booking, I only got a table in the middle of the terrace and probably too late anyway to see the full beauty of a Santorini sunset. The food was still great amidst the warm summer night. I fell in love with this island on my very first night. 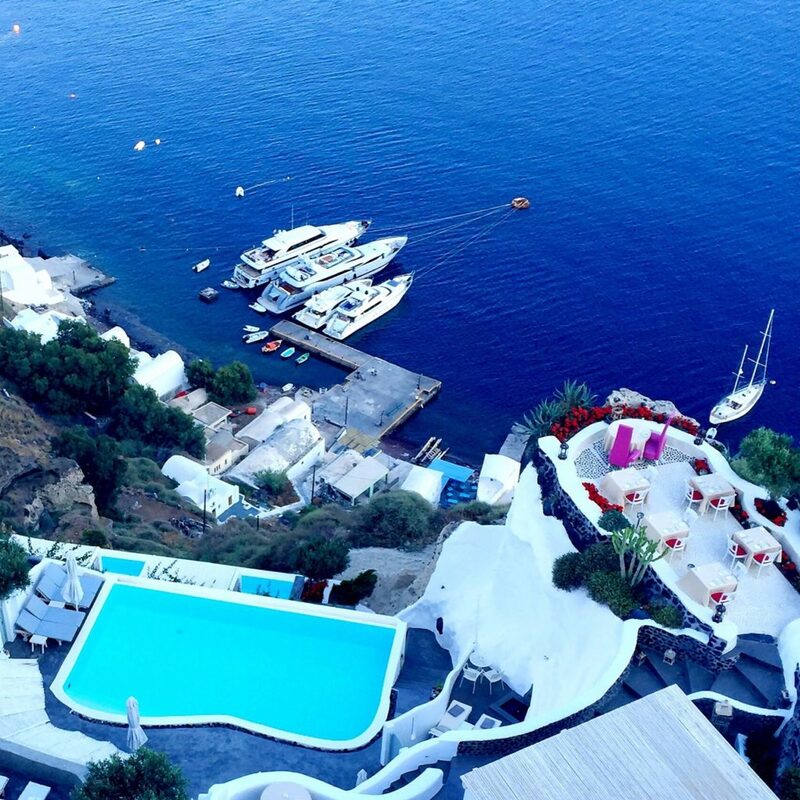 Be aware – catching sunsets in Santorini comes a bit with planning and a good strategy. Day 2 arrived and I was on a mission to catch the sunset in the most photographed spot of Santorini just behind the windmills of Oia. I nearly gave up on my way to this part of the town because it was scorching hot and overcrowded in the small lanes. 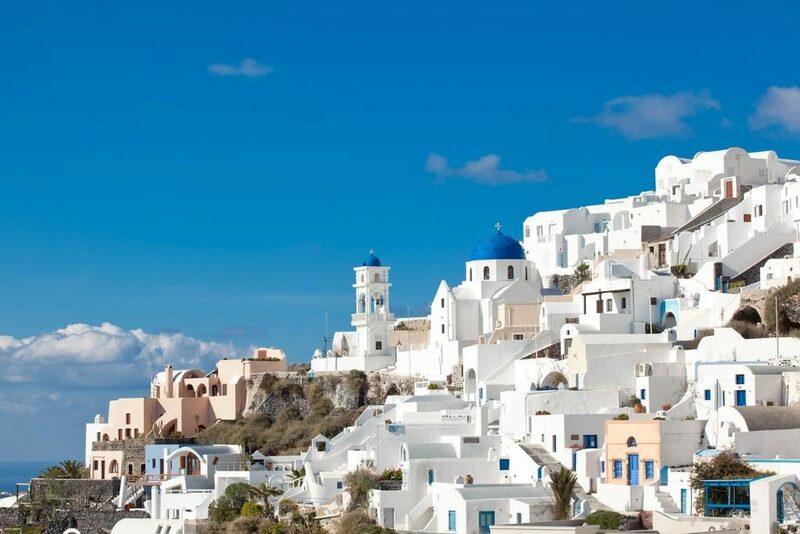 Oia is everything they say about it – you just want to stop at every corner and snap a picture. Well that’s actually what I did, did I mention that I was already late for the golden hour? When I finally arrived at the front, I was shocked at the number of people that had the exact same plan as me. I was also jealous of the couple that had a prime view with a bottle of champagne at a table by Sunset Cafe. It turns out not many tourists are willing to splash out on a bottle of Moet so I booked it for the next day. I mean, why else would I pay the annual contribution of three credit cards, if not for some spontaneous spending? It turned out the service at the Sunsets was excellent, the staff very friendly and the food left me to believe I must finally be in heaven. We even got free shots (I’m talking alcohol, not photography) and the sunset-dessert plate, to finish off a perfect night. While on my mission to locate the most romantic Santorini sunset, I simply had to try out the capital of the island, Fira. What I liked about Fira was the fact that you have an excellent choice of bars and restaurants all facing the caldera. Definitely, try out Pelekanos. They do lovely handcrafted cocktails. Alternatively, choose one of the countless rooftop lounges, for a spectacular view. It was another stunning sunset, and I would love to see more of Fira town next time I return to the island. I was so tired after my boat trip that day, I just wanted to go to bed early that evening. Now if all the pictures thus far have not convinced you, or you are just not a fan of big crowds, let me share the last and most magical one. Our landlord from the apartment we were staying at had insisted on us having dinner with him that night and I could not say no. 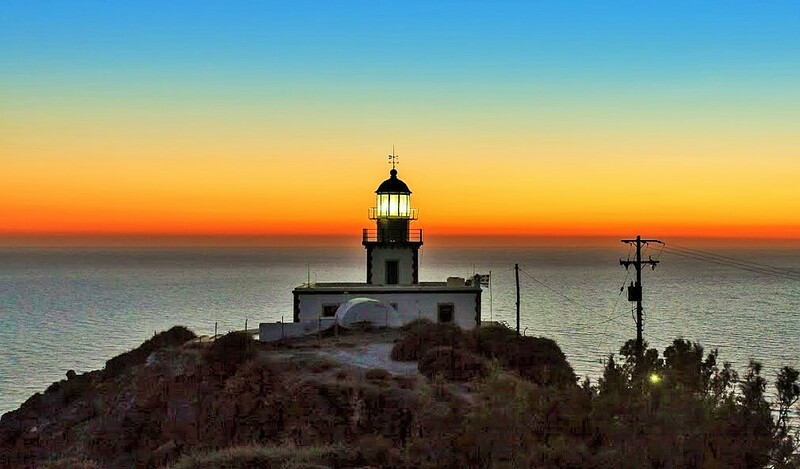 After dinner, I got the spontaneous idea to pack some blankets, a chilled bottle of champagne and some glasses, and drive up to the Akrotiri lighthouse. Our driver, Jimmy from the day earlier had raved about this place for sunsets. While the lighthouse is a spot to take stunning pictures during daytime it is even better at the golden hour. So remember, always listen to the locals. There were a few sunset-seekers by the front of the lighthouse but no one walked up the hill behind. In my opinion, the back was an even better view as you could contrast the lighthouse against the changing colors of the sky.